The drive across the NASA causeway from Titusville, Fla., to the Kennedy Space Center was nasty business Friday morning, July 8, as an estimated 1 million people from across the U.S. crowded the space coast to watch the final liftoff of the final space shuttle, 30 years after the first one flew. The entire million went home happy. 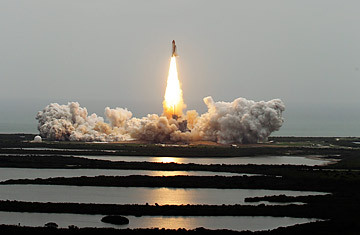 Despite a persistent cloud cover that parked itself directly over Cape Canaveral early in the morning, the shuttle Atlantis lit its engines at 11:29 and 3.9 sec. E.T., after a heart-stopping hold at T-minus-31 sec., when the data sent back from the retractable arm that holds the "beanie cap" covering the tip of the external tank suggested the arm might be stuck. But the data cleared up, the arm worked fine, the clock resumed, and the ship launched. The odds of that liftoff actually taking place as scheduled were not considered very good  just 30%, according to an official NASA estimate that hadn't changed in the previous 24 hours. The agency's reluctance to launch into rain clouds is a result of a near disaster 42 years ago when Apollo 12 took off. The Saturn 5 booster that carried that mission launched into threatening skies and was struck by lightning before the tip of the rocket even pierced the cloud bank. The entire guidance platform  its multiple-gyro orientation system  was wiped clean and had to be reprogrammed in Earth orbit before the ship could head to the moon. John Aaron, the 20-something flight controller who figured out how to do that tricky piece of computer fiddling, became a NASA legend that day and forever after went by the sobriquet "steely-eyed missile man." There's not a controller alive who wouldn't like that kind of recognition  and not a controller alive who would want to be put in the position in which Aaron was placed in order to earn it. Fortunately, the July 8 clouds yielded no rain, and the mission was a go. The crew  commander Chris Ferguson, pilot Doug Hurley, mission specialist Sandra Magnus and mission specialist Rex Walheim  are all shuttle veterans, with a collective seven previous flights among them. The 12 days the crew will spend in orbit will be busy ones: a docking with the International Space Station, followed by cargo transfer, equipment repair and installation and a spacewalk by Mike Fossum and Ron Garan, two astronauts already aboard the space station. But that's all for later. At the moment, the mood at the cape is giddy. Far too many of the shuttle's 134 previous launches were listlessly reported affairs; the saturation of coverage today was a reminder of the era when every spaceflight was a national event. NASA officials insist that those good times are coming again soon, and both the Orion deep-space vehicle and the low-Earth-orbit private boosters now being planned will make them a reality. NASA deputy administrator Lori Garver was working the crowd this morning talking up that idea. Her job is a challenging one  herding the cats of tight budgets, a recalcitrant Congress and a public that is more interested in knowing when American ships will be flying again than considering the details of how that would be done. Like Aaron, she is in a position not a lot of people would envy. Still, it would be nice if NASA and its contractors would get their schedules and their talking points straight. As Time.com reported yesterday, the Orion spacecraft is aiming for a manned flight in 2016, but unless NASA selects a plan for a heavy-lift booster in a hurry and somehow picks a contractor who can test and build it in less than five years, that deadline is well-nigh impossible. Garver herself admitted this morning that a good target range for booster completion will not come for at least a month, when the agency gets a little more budget clarity. Nobody, she concedes, should be taking 2016 to the bank. 30 Years of Space Shuttles: What Now? Of course, in NASA's long history, a lot of things were considered entirely unbankable  not the least being that a country that had not put a single human being into space before 1961 could somehow get two of them onto the surface of the moon by 1969. History will note that that commitment was met. On that July 20 day, 42 years ago, Koishi Wakata was a 5-year-old boy growing up in Saitam, Japan. Wakata watched the moonwalk, found it abidingly cool and decided space might be a fun career. He's at Canaveral today, a veteran of three shuttle missions and a 4½-month stay aboard the space station in 2009. In two years, he'll be back on board the station, this time flying as a passenger in a Russian Soyuz spacecraft. He has little doubt that if he remains an active astronaut long enough, he has at least a theoretical shot at flying aboard an American ship again  and that it will be a good one. "Only the United States has flown a reusable spacecraft, so only the United States knows the challenges of making it work right," Wakata says. "The knowledge gained from the shuttle program  including what we learned when we lost 14 precious lives  will make the next American spacecraft better and safer." That kind of optimism in the face of massive fiscal and policy challenges is being echoed everywhere at the cape today. It's a sense of pride, relief and cockeyed hope  to which NASA is wholly entitled on a day like today. See the 25 best blogs of 2011.